Home > Special Offers > Sales > Get the 2019 Legacy today! 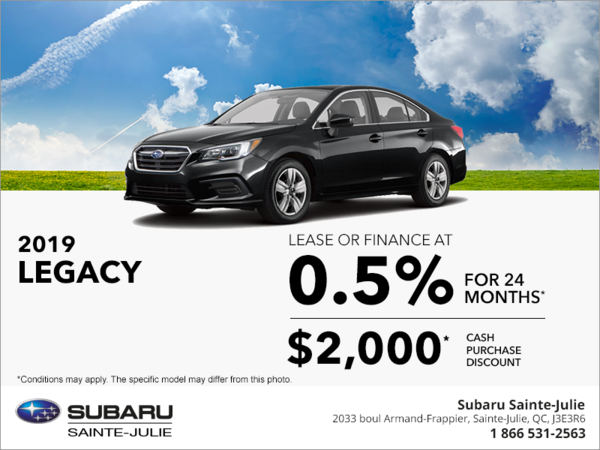 Lease or finance the 2019 Legacy starting at 0.5% for 24 months. 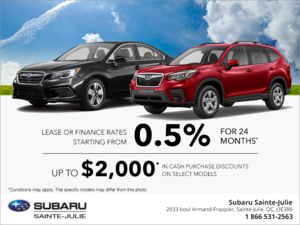 PLUS get up to $2,000 in cash purchase discounts on select new models. 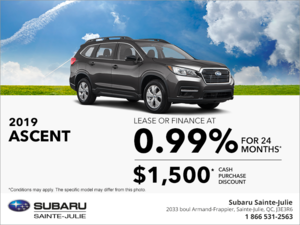 Limited time lease offer is provided through Subaru Canada, Inc.'s financial institution on approved credit. 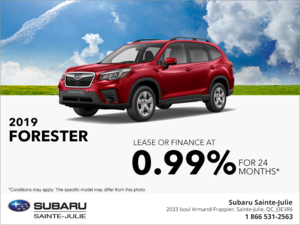 0.5% lease APR for 24 months. Representative example based on a new 2019 Legacy 2.5i KA225: With down payment of $0.00, monthly payment is $624.04 and includes MSRP $24,995 plus $1,650.00 freight and PDI, $100.00 air conditioning surcharge, $15.00 duty on new tires, $0.00 dealer administration and documentation fees. 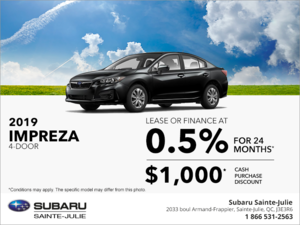 Specified down payment or equivalent trade-in, $0.00 security deposit and first monthly payment are due at lease inception. Total lease obligation is $14,976.84. Other taxes (including, where applicable, GST and PST or HST), license, insurance and registration are extra. 24,000 kilometre allowance; charge of $0.10/km for excess kilometres. 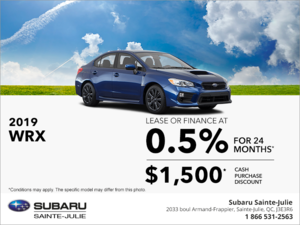 Dealer may lease for less. Offer applies to dealer in-stock inventory only. Dealer order/trade may be necessary. Offer subject to change or cancellation without notice. Other lease rates and terms may be available. 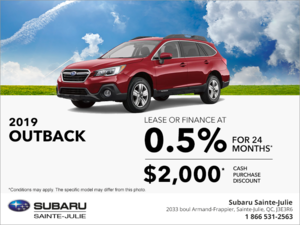 See your participating Subaru dealer or visit www.subaru.ca for details. Limited time offer for a new 2019 Legacy 2.5i KA225 and includes MSRP $24,995 plus $1,650.00 freight and PDI, $100.00 air conditioning surcharge, $15.00 duty on new tires, $0.00 dealer administration and documentation fees. Other taxes (including, where applicable, GST and PST or HST), license, insurance and registration are extra. 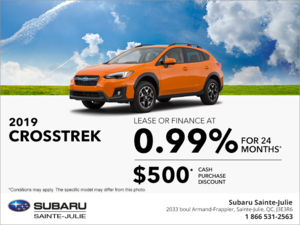 Where applicable, cash purchase discounts are for cash purchase only, cannot be combined with lease/finance offers and are deducted from the negotiated selling price before taxes. Dealer may sell for less. Offer applies to dealer in-stock inventory only. Dealer order/trade may be necessary. Offer subject to change or cancellation without notice. 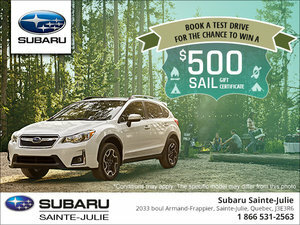 See your participating Subaru dealer or visit www.subaru.ca for details.